As you look at a battleship, you immediately sense its power. Huge guns, a sleek profile and a superstructure bristling with equipment signal that this ship means business. Battleships dominated the seas from World War I to World War II and served with distinction in the US Navy all the way through Operation Desert Storm. USS Wisconsin (BB 64), the third of four Iowa-class battleships to be built, now rests in honorable deactivated status in Norfolk, Virginia, as part of the Nauticus ​museum complex. The battleship USS Wisconsin was commissioned in 1944, three years after her keel was laid in Philadelphia, Pennsylvania. USS Wisconsin supported operations in the Pacific Theater during World War II, earning five battle stars. The battleship was decommissioned in 1948. "Wisky" was brought back to life in 1951 to serve in the Korean War, earning another battle star during that conflict. Decommissioned in 1958, USS Wisconsin spent almost 30 years in mothballs before being refitted and recommissioned in 1988. USS Wisconsin served in Operations Desert Shield and Desert Storm, maintaining a significant presence in the Persian Gulf, providing critical support to the forces dedicated to liberating Kuwait and earning a Navy Unit Commendation. The mighty battleship proved too expensive to maintain in the face of post-Gulf War budget cuts, and USS Wisconsin was decommissioned once again in 1991. After spending several years in the Philadelphia Naval Shipyard, the battleship moved to Norfolk Naval Shipyard in 1996 and to Nauticus shortly thereafter, thanks in large part to the veterans who served on board and the people who developed the concept of a world-class maritime museum in Norfolk. "Wisky" is listed on the National Register of Historic Places and is owned and operated by the city of Norfolk, Virginia. 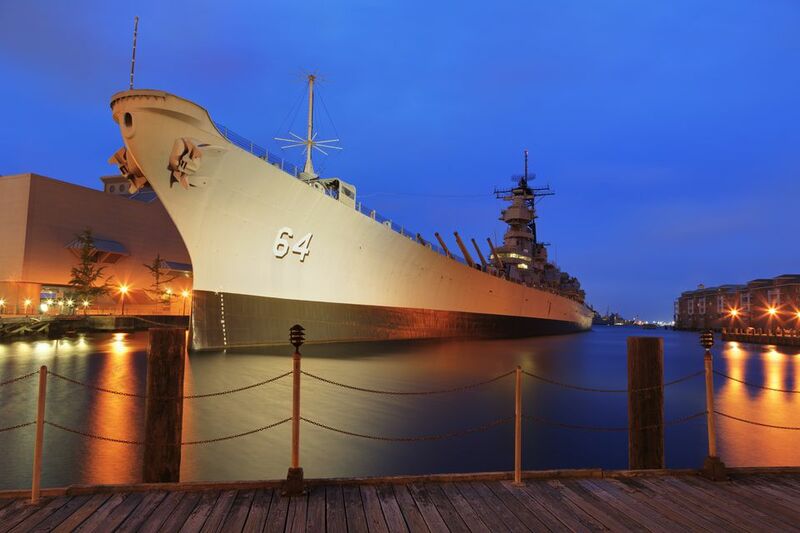 To see the battleship, you'll need to head to Nauticus on Waterside Drive in Norfolk, Virginia. This maritime museum includes hands-on exhibits covering the period from the late 1800's to the present day. You can design a ship, help uncover the remains of the Civil War-era USS Monitor with a robot arm and get acquainted with the sea creatures of the Hampton Roads area. Special exhibits focusing on maritime themes and battleships add to the Nauticus experience. You can take a self-guided tour of two levels of the ship, including the main deck, officers' wardroom, galley, mess deck, chapel and sailors' berthing. Docents are available to answer any questions you might have about the battleship. If you want to see the ship's bridges, the Captain's stateroom, Admiral's stateroom and Combat Engagement Center, you will need to buy a Gold ticket, which includes a guided tour of these spaces. Your tour will take you up and down ladders (narrow metal stairways) and into cramped areas of the ship; there is no elevator. If you are physically able to take this tour, you will find it quite interesting, as you will be seeing the places where combat decisions were made during the heat of battle. Special guided tours, which cost extra, are offered twice per day on weekdays and once on weekend days. One of these tours takes you to the spaces included in the Gold ticket. The other takes you to the engine room. USS Wisconsin's massive superstructure and 16-inch guns, which fired shells weighing 2,700 pounds each, dominate the main deck. The gun turrets could rotate so that all nine guns could fire a full broadside, with a range of up to 23 nautical miles. As you stand on this meticulously-maintained teak deck, you'll begin to realize that this 887-foot ship was home to nearly two thousand sailors, all trained to work together to achieve a common goal. Sometimes away from home for months at a time, the sailors had "steel beach picnics" on the main deck's helicopter landing area, competed in athletic contests against other ships' crews and drilled, prepared and practiced for engagement with hostile forces. Today, officers and sailors who served aboard Wisky hold reunions in Norfolk every two years so they can share memories, swap sea stories and see their beloved battleship once again. Limited handicapped parking is available; call ahead for information. All other visitors will need to park in one of the public (pay) garages near the Nauticus complex. Tip: If a cruise ship is in port, no handicapped parking will be available. The museum is wheelchair-accessible, as is the main deck of USS Wisconsin. There are no elevators on the ship. The museum has a few wheelchairs available for visitor use on a first-come, first-served basis. Assisted listening devices are also available. Nauticus' Dockside Café serves burgers, sandwiches, wraps, flatbreads and Caribbean bowls. The museum's Banana Pier Gift Shop sells souvenirs, books, apparel, toys and more. Nauticus is closed on Thanksgiving Day, Christmas Eve and Christmas Day. Hours may be limited on other holidays. Call the museum for more information.